Biodiesel is consistent with Trump's mission to bring back American manufacturing jobs, make the U.S. energy-independent, protect clean air and water, and, through reforming the biodiesel tax credit, end subsidization of foreign production. Austria-based BDI-BioEnergy International AG increased sales by 43.6 percent in Q3 to a total of 28.6 million euros (USD$31 million), up from 19.9 million euros in Q3 2015 due to the implementation and completion of various projects on schedule. Natural Chem Group has acquired a bankrupt ethanol plant in Portales, New Mexico, where it is developing a terminal to blend 1 million gallons of biodiesel a month for regional fleets. NCG plans to build a 90 MMgy biodiesel plant 20 miles north. 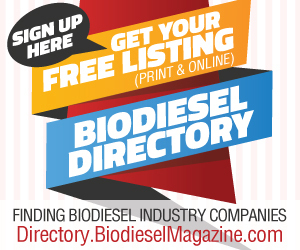 Biodiesel producer Biodico announced Nov. 16 that it has completed its resource assessment to support the next stage of development for its Zero Net Energy Farm project to create environmentally sound energy solutions for the state's ag industry. EPA proposed Nov. 10 denying requests to change point of obligation under RFS as requested by oil refiners. The agency cites a burdensome increase in program complexity with no benefit, while creating uncertainty, confusion and blocking investments. Germany-based biodiesel quality management association AGQM has started its 11th no-harm test for biodiesel oxidation stabilizers and its second no-harm test for biodiesel heating oil. In the past 10 test rounds, 47 of 69 tested additives passed. Renewable Energy Group Inc. broke ground Nov. 8 on a $24 million biodiesel plant expansion in Ralston, Iowa, a project that will boost capacity from 12 MMgy to 30 MMgy. REG expects up to $20 million in long-term debt financing will be provided. National Biodiesel Board members selected their trade association leadership this week during the annual fall membership meeting held in St. Louis, electing six returning governing board members and one new member to serve in leadership roles. Thomas Davanzo of Estero, Florida, and Robert Fedyna of Naples, Florida, were sentenced Nov. 7 to 121 months and 135 months in prison, respectively, for their participation in a multistate scheme to defraud biodiesel buyers and U.S. taxpayers. In the third quarter, REG sold a total of 163.1 million gallons of fuel, an increase of 36 percent over Q3 2015. The company produced 114.8 million gallons of biomass-based diesel during the quarter, a 35.2 percent increase from last year's Q3. The project uses a 25,000-liter photobioreactor within a pilot-scale algal biorefinery to recycle CO2 and other airborne industrial pollutants into algal biomass that can be further converted into sustainable products, including renewable fuels. Changes include a new format that makes understanding how to apply the standard easier, streamlined and clear impact assessment requirements, integration of GHG calculation requirement with other measurement tools, a grievance mechanism and more.